If you’ve accidentally downloaded a sensitive image file that can get you into trouble, deleting the file from Windows is just not enough even if you’ve perform a secure wipe. Forensics people can still retrieve the image from your computer, thanks to the thumbnail caching feature. When you open a folder containing a lot of images, the thumbnail caching feature will greatly improve the time that takes to show the images via thumbnails rather than regenerating them every time you get in to the folder. This thumbnail caching feature can be an invasion of privacy and we’ll show you how to view the thumbnails inside the database cache file, clear them and and also how to disable it from caching more thumbnails. You cannot just open the thumbnail files on an image viewer to see the cached images. 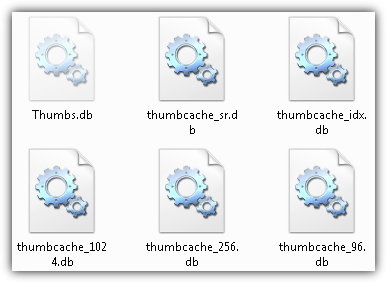 You need a special dedicated program called Thumbs Viewer for loading thumbs.db and Thumbcache Viewer for loading thumbcache_*.db files. You will need to manually load the thumbs database cache file to the viewer either from the File > Open or drag and drop the thumb files to the program. The location below is where you will find the thumbcache database files for Vista/7. As for thumbs.db, they can be located in any folders that you have previously opened an image file. Just do a search of thumbs.db at the Windows Explorer search bar. Once the thumbnail database is loaded in the viewer, you will see a list of all the thumbnails being cached where you can instantly view it by clicking on the filename and also save the cached thumbnail through the right click context menu. Do take note that the remove selected feature simply removes the thumbnail cache from the list and it will reappear on the list again when you reload the thumbnail cache file to the viewer. If you feel uncomfortable of Windows secretly generating cached thumbnails of the images that you’ve viewed, your next step is disable the thumbnail caching first before deleting them or else they will be re-generated again. There are two ways to do it to completely disable generation of thumbnails database. 1. Go to Control Panel > Folder Options > View tab > tick “Always show icons, never thumbnails” on Vista and 7. On Windows XP, tick “Do not cache thumbnails” instead. Enabling this option will stop Windows from automatically saving the generated thumbnails in database and you will notice that all images are now showing their icon instead of thumbnails. 2. Download this registry file and run it. This reg file will add a DWORD of DisableThumbsDBOnNetworkFolders with the value 1. When you apply this registry fix on your computer, thumbs.db will not be generated on network shared folders. However when other computers on the same local network that didn’t apply this registry fix access your shared folders, thumbs.db will be generated on your shared folder. If you have multiple Windows computer in your network, it is best to install the registry fix on all of the computers. You cannot manually delete the thumbcache_32.db, thumbcache_96.db, thumbcache_256.db, thumbcache_1024.db, thumbcache_idx.db and thumbcache_sr.db files because they are locked. CCleaner has an option to remove Thumbnail cache but it is possible that sometimes it doesn’t work. In one of our test, CCleaner reported 0 bytes to be removed on analyzing with the Thumbnail Cache option enabled. 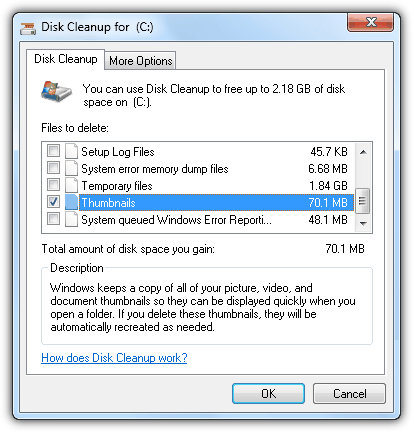 Thankfully the built-in Disk Cleanup tool that is found in Start > All Programs > Accessories > System Tools > Disk Cleanup can remove the thumbcache files. Simply tick the Thumbnails checkbox and click OK. The .db files will be moved to a ThumbCacheToDelete folder where it will be automatically deleted when Windows is rebooted and new .db files will be recreated. So is there a way to force the creation of thumbs either in the “username/appdata/etc…” or preferably the local directory that contains the full images? or a registry edit that is something like “enableThumbsDBOnNetworkFolders”? If you don’t want to or cannot reboot at the moment, you can open ctrl+alt+del and end the explorer.exe process. This will unlock and free the file and contents to be deleted manually. Next, in taskmanager, click new task and type explorer.exe to restart explorer. Now you can go back to C:\Users\%username%\AppData\Local\Microsoft\Windows\Burn and delete the Temporary Burn Forlder completely. When you back out and look in the Explorer folder you will find the deleted files have been unlocked and deleted. This info is the one that I searched for a long time. Finally I can open thumb.db and export data. Its not for use but only interesting. Thumbs.db could be very dangerous – thanks for the informative post ! heyy how did you know it..!! its cool..